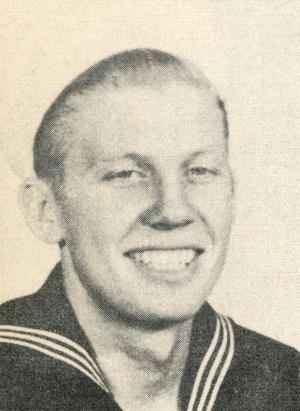 Obituary – Dufek Jr., George « Perry High School Alumni Association, Inc.
George Dufek, Jr., 19 year old son of Mr. and Mrs. Geroge Dufek of 700 Sixth street, Perry, was killed on Friday, May 14, 1943 in the crash of a naval airplane near Deland, Fla.
Dufek enlisted in the Navy August 30 last year in Oklahoma City, after graduating with the class of 1942 from Perry high school. He was co-captain of the Maroon football squad and a member of the basketball team. He was an aerial gunner, petty officer third class, stationed at Deland. Funeral services will be conducted Wednesday afternoon at 2:30 from Perry high school auditorium. Rev. Jack Oliver, former pastor of the First Christian church here and now of Blackwell, will conduct final rites. Burial, under direction of the Davis funeral home, will be in Grace Hill cemetery. The American Legion will be in charge of the military burial service. Pall bearers at the funeral will be Robert and Lee Roy Doyle, Herman “Katz” Eisenhauer, Doyle Lynch, Jack Dolezal and Jack Wilson. Survivors other than his parents include two sisters, Mrs. Frank (Virginia) Jones, Jr. and Mrs. Glenn A. (Dollie) Bay.